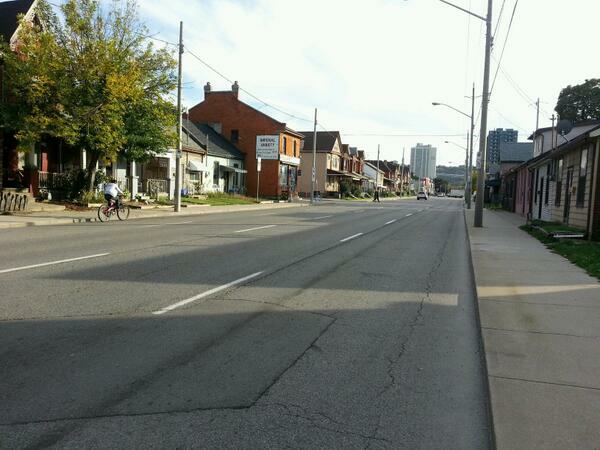 According to an article just posted on CBC Hamilton, Public Works managers are now saying the City can save money by scaling down excess lane capacity on city streets. The city is filled with five- and six-lane roads that were once packed with traffic, particularly in the north end where many were designed for an industrial economy that no longer exists. They’ve fallen into disuse over the years, and taking them out of commission would save taxpayers money, said Gerry Davis, general manager of public works. 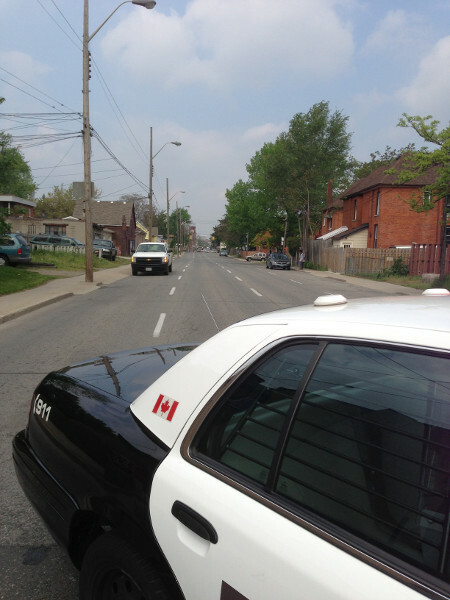 Maintaining one traffic lane for one kilometre costs as much as $12,000, Davis said. If the city identifies lanes that don’t get used much anymore and either puts in bicycle lanes or narrows the streets, it will save thousands in long-term maintenance costs. The city is looking at extra traffic lanes as part of a city-wide transportation master plan staff will present this year, Davis said. While eliminating spare traffic lanes isn't the mandate, it will be included. This is exciting news, and I hope City officials and Councillors will look at the following options to make our public rights of way more productive and neighbourhood streets safer and more accommodating for all road users: two-way conversion, protected bike lanes, wider sidewalks, street tree canopies, curbside parking and so on. Back in 2012, we managed to obtain some traffic volume counts from the City for various locations, but the data were from 1999, the most recent year for which the City would provide us with data. Based on that 1999 data, it was clear that many of Hamilton's streets - and particularly the multi-lane one-way thoroughfares - were significantly overbuilt. Streets like Cannon west of Sherman only carried 11,000 cars a day on four lanes, for an average volume of 2,750 cars per lane. For comparison, the City of Chicago's Complete Streets Guidelines specify that an arterial street with less than 25,000 vehicles a day should be one vehicle lane in each direction. But we were aware that the traffic volume data were over a decade old and we kept trying to obtain more recent numbers. Some critics suggested that traffic volumes likely increased since 1999 and the assumption that we still had surplus lane capacity was unfounded. The City wanted to charge us for access to the data, but after a helpful intervention by Councillor Brian McHattie and some very helpful staff, we managed to get our hands on traffic volume data from 2009-2010. We published them in December 2012. It was immediately obvious that traffic volumes hadn't gone up between 1999 and 2009. In fact, they dropped significantly across the board. Unfortunately, the two data sets don't cover all the same locations, but for the locations that do match up, the declines range from 6.15 percent to nearly 38 percent! Of course, anyone who has been paying attention to Hamilton one-way timed thoroughfares - particularly anyone who gets out of a car and walks or bicycles on them - was already keenly aware of this. If the only way you ever experience lower city streets is in the middle of a pack of cars riding the green wave, this might not be obvious to you. Outside the pack, what you observe is a cluster of high-speed automobiles racing together down the street, followed by an expanse of desolation. Our excess lane capacity is also evident when we reduce lanes for road work, construction or collisions and the impacts on traffic are minimal-to-nonexistent. 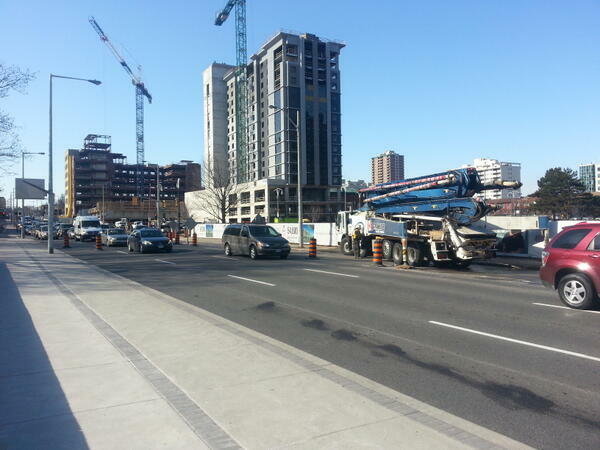 Both Main and King had lanes closed across Hwy 403 for many months with no impact on traffic flow. 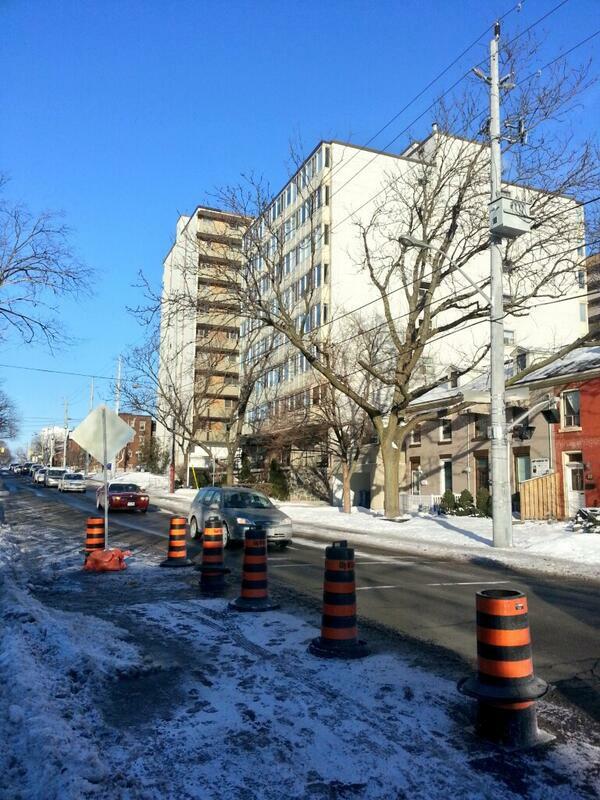 A lane of King was closed for construction at 275 King Street West apartment building for many months with barely any impact on traffic flow. Yet despite all this, the City still persists in planning and designing our streets on the assumption that traffic volumes are growing and will continue to grow. The York Boulevard redesign is Two-Way In Name Only (TWINO) - three eastbound lanes and one westbound lane with no turning west onto York from James. Former traffic engineering manager Hart Solomon (since retired) nixed a proposed pedestrian scramble because he insisted that traffic volumes would continue to increase. The planned redesign of Longwood Road will have five freaking lanes of traffic - four driving lanes and a dedicated centre turn lane - for just 18,000 cars a day. City staff are adamant that two driving lanes and a centre turn lane would cause unacceptable delays, even though the plan for a cycle track will now require the construction of a second bridge at a capital cost of millions of dollars. Council spent more than four hours agonizing over whether to add a protected bike lane on Cannon - a street that barely has enough traffic to justify two lanes, let alone four. The design actually rejected all-day curbside parking west of Victoria, leaving narrower bike lanes and less room for physical separation, because the consultants were instructed not to do anything that would slow traffic, even during rush hour. The assumption that traffic volume is like a background radiation that keeps increasing infuses all of the City's transportation plans. The only way, apparently, to overcome the tendency at all is for a project to come from a huge push by a group of engaged citizens - like Yes We Cannon - rather than from planning or transportation staff. Even setting aside the false assumption that automobile traffic volumes will always go up, the city's traffic analysis persists in ignoring the effects of induced demand - the tendency for traffic to increase or decrease based on available lane capacity. Dear Hamilton traffic engineers and status quo politicians: your maps and models are leading you astray. 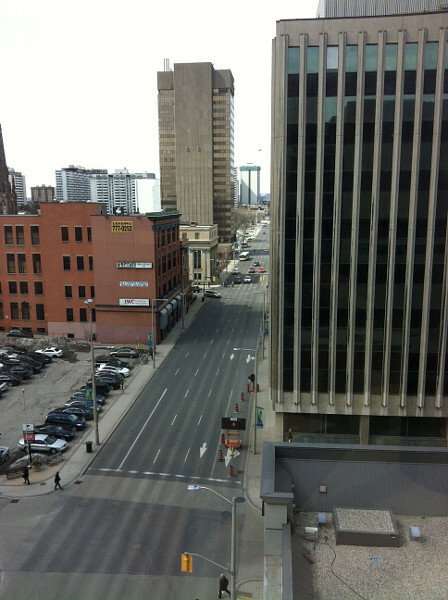 Update: Added even more photos of empty lower city streets. I'm guessing that the work done on Victoria Street north of Barton will be the template: convert the rightmost lane into an unprotected car-width bike-lane - a very wide buffer protects the rider instead of any physical barrier. This keeps the lane "fallow" thanks to its minimal load, but it can still be ploughed as a car-lane and they can use it for cars during road-work on the car lanes. It's the cheapest way to take a lane out of commission and serve cylists. I imagine we'll see this treatment appear throughout the over-built industrial roads in the north-east end of town. Although I'm still totally confused why the bike-lane starts at Barton and why Wellington didn't get the same treatment - they were re-built within a year of each other, and there are now obvious benefits to connecting to Cannon. It really is mind boggling how the lane on Victoria starts north of Barton. And how Wellington has no lane at all. And why Victoria/Wellington are an insane FOUR lanes wide. One quibble - the reason teh Cannon St bike lane will be narrower West of Vicotria has nothing to do with potential slow down of traffic - but the impact on the bus service. There's very little recovery time for the #3 Canoon, so even if the delay was 1 min or so, it could lead to the need for another bus being put on the route. That feels like a cop-out to me. I'm pretty sure the City could figure out how to make the Cannon bus schedule work with a slight slowdown during rush hour if it was important enough. Instead, the cycle track is going to be too narrow and the physical separation too thin and flimsy for 24 hours a day, because the north curb lane needs to be maintained as a vehicle lane for 1 hour a day. I hope downtown councilors make a big stink about this, poring over the capital cost and spending half a day on how much it will be to plough all those extra lanes in the winter. Maybe we'll have to close the extra lanes if it costs too much. After all Rymal Road belongs to the entire city, not just the people who live there! Also the councillors Rymal runs through have "an avowed interest" in it so their opinions don't count. Right? The RHVP has been successful in creating an alternative to downtown through traffic. Time to take back the streets. "In general, they reported that there has often (but not always) been a fairly short period of traffic disruption, but that 'gridlock' or 'traffic chaos' are rare, and never last longer than a few days, as traffic adjusts relatively quickly to new conditions. Sometimes there has not even been a short-term problem." This reinforces the Swedish article from Dec 2012 which talked about implementing congestion taxes and how people's driving habits changed to avoid the tax; either not driving at all (car pooling or transit) or shifting their driving time to avoid the tax. Which leads directly to public transit funding and reducing gridlock on our highways. Why are our politicians (both Provincial and Municipal) afraid to implement a congestion tax in the GTHA to support transit? Well, first because it's political suicide. Look at how the Wynne government has had to walk back even the most reasonable revenue tools (parking spot and gas-tax fees). But also because congestion fees are so expensive to run that they can fail to really deliver on revenue. It takes a lot of infrastructure to monitor and bill all those drivers. Luckily we already have a company in Ontario that has been running such infrastructure for 17 years. I'm sure 407 ETR would be more than happy to lend assistance in setting it up and maintaining it. Even if it doesn't deliver on revenue, it will still shift people's driving habits and reduce congestion. If the city identifies lanes that don’t get used much anymore and either puts in bicycle lanes or narrows the streets, it will save thousands in long-term maintenance costs. There's the talking point. Highlight, circle, underline, lather, rinse, repeat. Something that many of us have been saying for a lonnng time. I have not had time to pull the quote from the video, but Collins made a very compelling argument for citywide lane diets during the GIC meeting. He deserves congratulations and encouragement for finally getting it. I have been harping on about this for years - it comes down to the sheer unaffordability of maintaining unused traffic lanes. We have no choice but to do something about it. Especially when everything gets framed as a fiscal argument. It's hard to "win" debates when the benefits are softer: environmental, social, future planning, etc. This helps make the case there are financial benefits to bike lanes too. I doubt, however, this will end the opposition. Now where have I heard that argument before? Might I add, a multi-use path along Burlington Street from Wellington all the way east in a similar fashion to the one just built between Gage and Ottawa. Looking at the CBC article, it's going to be tricky to figure out what to do with the Clairmont and the Sherman Cut if they frame this as a cost-saving thing. I mean, the Cannon lanes demonstrated that a separated path is expensive, and a non-separated path on a highway like the Clairmont would be useless except to the most heroic cyclists. If you could make it wide-enough to run a full-sized plough up it, it would work without adding much cost... but the Clairmont's middle barrier is a permanent installation, so it's not like you can divide its 6 lanes into an even 2/2/2 with a pile of Jersey barriers. use concrete barriers like the ones that have been on the Claremont the past 2 years. Take the entire southern lane for a protected multi-use path - bikes/peds and then veer it off towards Charlton Ave on the ultra-wide ramp and 3 lane approach to Charlton which can easily be two car lanes, one protected bike/ped lane. On the northern-most lane coming up the Claremont, have concrete barriers with a protected multi-use path from Burlington St all the way up to Mohawk College via the ramp at the top that cuts over to West 5th. Again, it's 2-lanes and only 1 are needed. I agree that cost-savings is the right talking point, but I was heartened to see this attribution to Chad Collins: '[Collins] envisions getting rid of some of the lanes and expanding the lawns of homes lining it, or putting in bike lanes. “It’s not pedestrian friendly. It’s not kid friendly," he said. "It’s just not a friendly environment for most people. It’s hard to encourage people to move into those areas when they see those obstacles in front of them.”' Cost-savings AND appreciating real property values... those aren't the most important reasons but they may be the best leverage points. I'm specifically thinking of the mountain accesses, and those aren't anybody's front lawn. They are the big question-marks. Sorry - I had in mind earlier comments above, about the rhetorical significance of the cost-savings argument in the present political environment. I don't have any light on what to do about the Claremont and Sherman accesses. 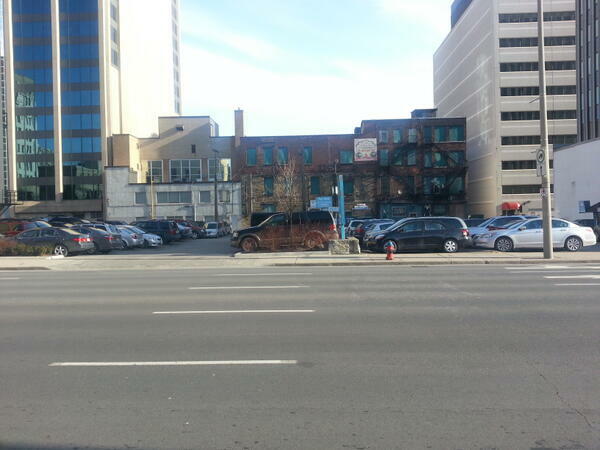 The Claremont coming down to Victoria and Main is a real-life caricature of excess road capacity. 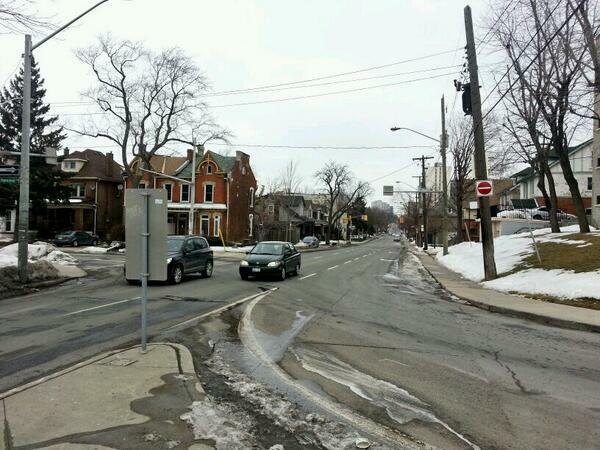 Yes, that intersection is my nomination for the most obscene road design in the city. A piece of engineering that shuts its eyes and hums so it doesn't have to recognize that it exists in a dense urban neighbourhood. A freeway design that cuts four and five lane one way streets with no crosswalks into an urban neighbourhood. A gratuitous freeway style on-ramp that cuts Claremont through the grid structure, and wastes large amounts of land (see the three useless triangles of grass). 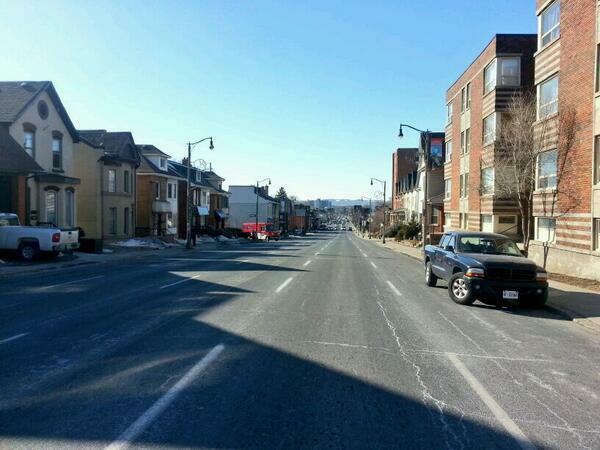 All so Claremont can swell to six, mostly unused, lanes! This design is encouraged by fact Wellington and Victoria are (needlessly) one-way. You can't see it on the map, but Claremont near Hunter/Wellington/West actually has chainlink fences that stop pedestrians even accessing the street network (e.g. walking south along West Avenue). The design treats Claremont like it is a limited access freeway that needs walls around it! Main/Wellington/Claremont/Victoria create a traffic sewer moat of 5-lane one-way streets around the little urban enclave of houses, apartment buildings, a church and the Canadian tire that has to rely on vestigial remains of West Av and Hunter as its only roads, at least the only roads that actually serve the neighbourhood. The "easy" fix here is to make victoria and wellington two-way, making victoria the only route to/from claremont, and eliminate that diagonal ramp. Hunter could be reopened and the previous ramp-lands sold to developers to build infill townhouses. It looks identical to the 403. Three lanes in each direction, highway divider, and what appears to be the same width. It is built to BE another highway up and down the mountain. Definitely vestigial from the Industry days. I share the perception that the surprising part, is that these vestigial layouts are rebuilt the same each time, at high cost, rather than scaling to something more appropriate to the current employment and traffic trends. The orange "bicycles single file" sign at the top of the Claremont is cute, vehicles easily get to 80-90kph on that access. Look at the Kenilworth/King highway-style overpass, which the City just rebuilt at a cost of millions of dollars without ever seriously considering whether we need such grossly expensive, wasteful and overbuilt infrastructure. One hypothesis I have, is that because the planning and design stages of most projects are so horribly done and inefficient, that under the present administrative structures, the redesign phase is more trouble than a simple copy of what was there before. Look at the (minimal but attempted) arguing over the Cannon project. Look at the intense arguing over King bus lanes, LRT, and so on. 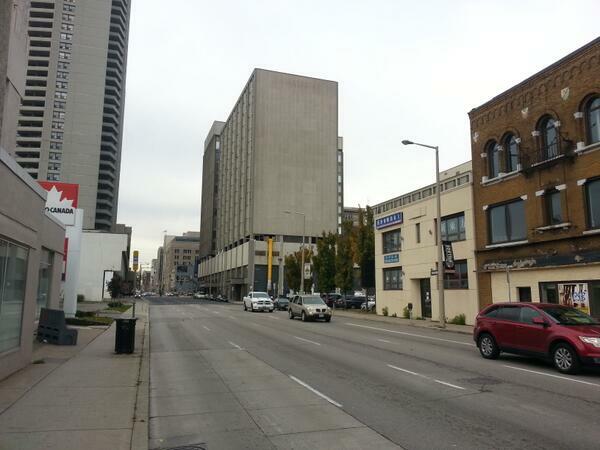 Imagine the can of worms that would open if the Claremont was opened up to discussion for redesign. This is not a good or rational situation to have exist, but it looks like there it is. But that's where initiatives like YesWeCannon, which we generically started calling Consulation 2.0, is exciting because it may begin balancing out some of this. The Claremont was a godsend when it was built. People who worked down on Wellington and Victoria N, in those days a huge proportion of the City, got to work safely and efficiently. 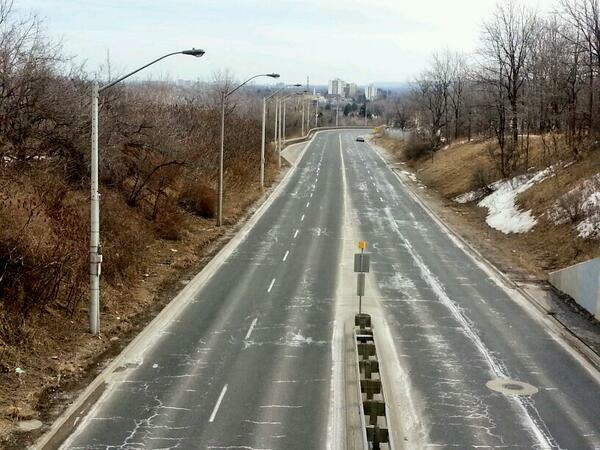 It probably would not have been built if the Red hill Creek Expressway had have been built in the late 60's. Since the unions scared all the work away, and since the RHCE has been built, it looks silly and out of place. However, given that the escarpment divides the City, there is still a need for numerous efficient accesses, maybe just not that big. Now it's just a matter of Council waiting until 2019 in order to establish the trend line. Coming from Montreal, I am always surprised by how much people in Hamilton debate traffic congestion. This city is incredibly easy to drive through even at "rush hours". When I lived in Montreal I spent a great deal of time finding alternate routes and planning my day around expected traffic congestion. In Hamilton it is almost a non-issue. My guess is that you could reduce alot of the traffic lanes in this city and not induce any real gridlock. The problem is the expectations and perceptions of those in Hamilton who expect to be able to drive across the city at 70+km/h without interruption. For most people in large cities that is simply not the reality. Exactly. Driving across lower city Hamilton, the indignity of getting stopped behind a red light qualifies as "gridlock" for people who expect to be able to drive unimpeded anywhere, any time at any speed. But the same people who constantly harp about inefficient government wasting their hard-earned tax dollars fail to see the irony in defending our utterly unaffordable overbuilt transportation system, the unfunded lifecycle maintenance cost of which falls nearly $200 million deeper in the hole each year.